Trailer for Robert Rodriguez's fourth installment of Spy Kids, 'Spy Kids: All the Time in the World.' It stars Jessica Alba, Jeremy Piven, Joel McHale, Rowan Blanchard, Mason Cook, Antonio Banderas, Danny Trejo, Ricky Gervais, Alexa Vega and Daryl Sabara. On the surface, Marissa Cortez Wilson (Jessica Alba) has it all...married to a famous spy hunting television reporter, a new baby and intelligent twin step kids. But in reality, trying to mother Rebecca (Rowan Blanchard) and Cecil (Mason Cook), who clearly don't want her around, is her toughest challenge yet. Also, her husband, Wilbur (Joel McHale), wouldn't know a spy if he lived with one which is exactly the case - Marissa’s a retired secret agent. Marissa's world is turned upside down when the maniacal Timekeeper (Jeremy Piven) threatens to take over the planet and she's called back into action by the head of OSS, home of the greatest spies and where the now-defunct Spy Kids division was created. With Armageddon quickly approaching, Rebecca and Cecil are thrust into action when they learn their boring stepmom was once a top agent and now the world's most competitive ten year olds are forced to put their bickering aside and rely on their wits. 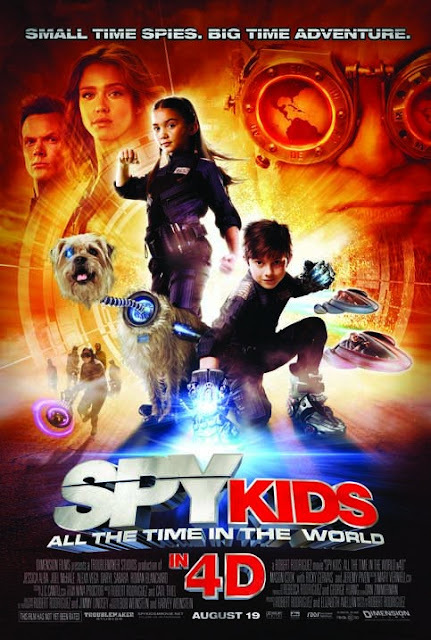 With a little help from a couple of very familiar Spy Kids, Carmen (Alexa Vega) and Juni Cortez (Daryl Sabara), and some mind-blowing gadgets, they just may be able to save the world and possibly bring their family together while they're at it. It opens in 3D and 2D theaters on August 19.